Protects your dogs and cats from fleas and ticks for up to 30 days. Spray directly on your dogs, cats, puppies, and kittens 8 weeks and older. 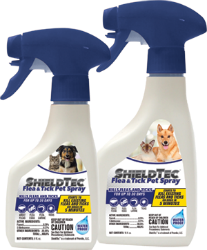 It starts working in just five minutes to kill fleas and ticks and control infestations. Breaks the flea life cycle. Kills Adult Fleas, Flea Eggs, Flea Larvae, and prevents the development of pupae. Kills Brown Dog Ticks, American Dog Ticks, Lone Star Ticks, And Deer Ticks For Up To 30 Days. Waterproof protection in rain, after bathing or playing in water.